This tools documentation is currently the bare minimum to get started. Also, the tools do not have a friendly user interface: some skill with the command line, including executable paths and such, is required. If you use them often enough, you may want to define .bat files or shell scripts to avoid repetitive typing. Linux / OS X note: the example commands are for Windows; for Linux and OS X use forward slashes ('/') instead of ('\'). All play-v6 tools are written in the Lua language and are system-independent: I tested them under Windows, Linux and OS X. Please let me know if you encounter problems. You need a Lua 5.2 interpreter to run the tools. You can get it here (just download the executables). The examples in this page assume that the Lua 5.2 interpreter is named lua52 and is in the executable path. The music compiler takes a music source file (a text file) and compiles it into a music code file, a compact block of binary data ready to be sent to play-v6, as described in the playing music page. This will produce a greensleeves.code music code file (as noted above, lua52 should execute the Lua 5.2 interpreter; also remember to use '/' instead of '\' for Linux and OS X). Lines beginning with '#' are comments and have no effect. Usually a file starts with the [main] section name. The main section is compiled by default (you may choose to compile other sections). time:3/4 generates musical accents for a 3/4 musical time (automatic accents are currently always enabled). tempo:4=140 means that the execution speed will be 140 quarter notes per minute. Dotted durations are allowed (such as tempo:8.=120). volume:f sets the global volume control to f; valid values range from ppp to fff. To use full dynamic range, the compiler will normalize the level to the highest volume actually used. instrument:violin is self-explanatory; refer to the instrument generator below for valid names, or for redefining them. transpose:-12 means to play the notes of the corresponding voice 12 semitones lower (i.e. one octave lower, in this case). mix:65% sets the voice mixer control to the given level (0% = silent, 100% = full). release:off disables the fast decay when a note terminates, making it decay naturally instead; its opposite is release:on. It has no effect on instruments where notes have a natural decay, such as drums and, often, guitar. do5:2 re5:4 do5:2 re5:4 p:4 do4:4 do4:4 p:4 la4:4 la4:4 p:4 mi4:4 mi4:4 la2:2. A group of lines (with no empty lines in between) represents a measure; each line defines a voice. A note such as do5:2 or its equivalent notation c5:2 means a C note (DO in Latin notation), octave 5, for a duration of 1/2. Dotted notation is allowed, e.g. c5:4.. (note the two dots) has a duration of 1/4 + 1/8 + 1/16. For a pause use p; for example p:4 is a 1/4 pause. A note can continue, even from a measure to the next by indicating the 'legato' with an underline sign, both on the starting and the receiving note. For example, do3:4_ _do3:8_ _do3:8. will play as a single note, for a total duration of 1/2. Triplets are indicated by appending t1, t2, t3; for example do3:4t1 p:4t2 mi3:4t3 means that the two notes and the pause, together, have a duration of 1/4 (the total time is right, but the first note in a triplet will be slightly longer, due to timing limitations). You may ask: why not just use a MIDI file and avoid all this trouble? Once you have successfully compiled some music, you can play it via remote control. To add it to the on-board Flash memory, see the music packer below. The first instrument (sine) is a pure sinusoidal sound that can be useful for tests, measurements and educational applications. It is a good idea to copy an existing instrument block, paste it at the end of the list and change its name to something such as test, to avoid messing up existing instruments (even if you are working to replace one of those). The first line contains the instrument name between single quotes; do not use spaces in the name. The following series of numbers (on one or more lines, it makes no difference) are the relative harmonics amplitude, in dB. In this example it is -21.5 dB for fundamental wave, -12.2 dB for the 2nd harmonic, -33.2 dB for the 3rd harmonic, and so on. The resulting wave will be normalized for the best dynamics, so only the dB difference with the fundamental level counts. See below (after the image) for hints on how to choose harmonic levels. attackDuration, in seconds, is the time taken to raise the volume linearly to the maximum level at the start of a note (see the image below). decayDuration, in seconds, is the time taken to decrease the volume exponentially from the attack peak to sustainLevel; it is a bit shortened in the image below for illustrative purposes (the last part is almost constant). At the end of the decay time, the volume will remain at sustainLevel (from 0.0 to 1.0) until the note ends. Instruments that cannot sustain a sound, such as drums, have a value of zero for sustainLevel, or a very low value if a minimal residual sound is more realistic (e.g. for a guitar). releaseDuration, in seconds, is the time taken to decrease the volume exponentially to zero after the note ends. testReleaseTime, in seconds from the start of the attack, has no effect on actual play: it is only used in the test sound (see below) to choose the moment when the test note ends (e.g. when a piano key is released). A simple trick to choose harmonics levels for a given instrument is to record the sound of an actual instrument, perform a spectrum analysis (e.g. 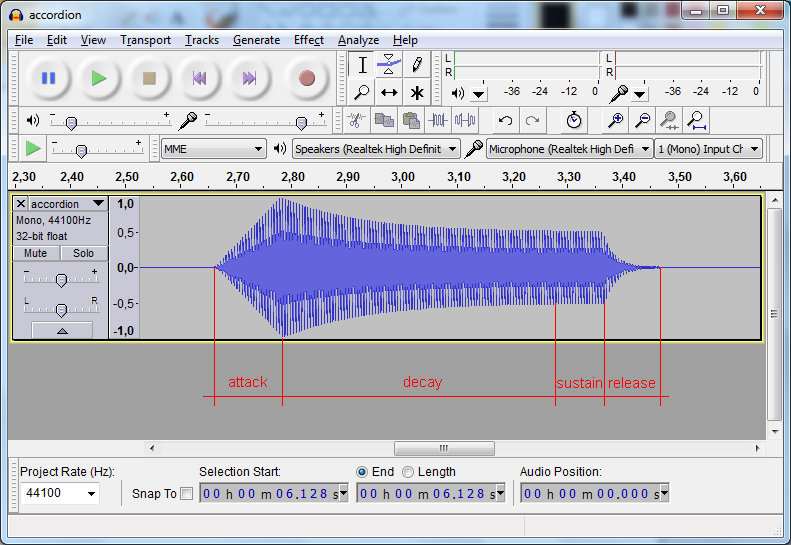 using Audacity), copy the measured values of the harmonics into the table and then listen to the test sound. To generate a test sound for the new instrument, the SoX utility must be installed and must be in the executable path. It can be downloaded from the SoX site. The resulting .wav file will contain five G / SOL note samples for the desired instrument, at different octaves; try changing testReleaseTime to see and hear the effect of different note durations (I know, this is a bit primitive, the instruments tool would deserve a real-time GUI). Do not expect too much: an actual musical instrument has a very complex and rich sound that changes with time and is different for each note, while play-v6 can only reproduce a single waveform. If you have changed the name of existing instruments without altering their position in the list inside instruments.lua, any music source file using those instruments will have to be changed accordingly (music already in Flash memory will play correctly anyway, with no need to recompile play-v6). If you have changed the position of existing instruments in the list inside instruments.lua, music files using those instruments will have to be recompiled and their new music code files must replace those already in Flash memory, using the music packer. Lastly (after using the music packer, if needed) recompile play-v6 and send the program to the Arduino. The music packer is needed to store music into the Flash memory of the Arduino microcontroller, so that it could be played with no USB connection to a computer. Then recompile play-v6 and send the program to the Arduino. If you run out of available Flash memory space, the compiler (actually, the linker) should complain; in this case, remove one or more music files from the list and reissue both the above commands. The table generator produces the note table that play-v6 uses to generate the correct pitch (frequency) for a given note; for example an A4 (LA4) note should have a frequency of 440 Hz. It also prouces the tempo table that controls, for each musical tempo setting (e.g. 120 quarter notes per minute), how long an 1/64 interval will last. A note about tuning: the table generator adds comments in player\tables.c indicating the pitch error for each note, assuming an accurate microcontroller clock. Unfortunately the Arduino Uno uses a cheap and imprecise ceramic resonator instead of the usual crystal. This could add a pitch error up to about 20 cents, but it does not affect the relative pitch between different notes, so unless you are a trained musician with an 'absolute ear' you will probably be unable to tell the difference.